Good day folks, and hello to you from New Brunswick. We arrived here are safe and sound and have been happily enjoying the company of family and friends. I had the opportunity to get down to the local LC and check out what new craft beers are in from local or regional brewers. Surprisingly there are a few! In fact there are some just opening on Monday which I plan to visit at the actually brewery (keep an eye open for the post). Remember that this beer is NOT in the Advent Calendar. Today’s beer comes to us from Petite Sault (little jump) brewery located in Edmunston, NB. It’s really close to the border of Quebec and has a predominately French population which is why the brewery name is French as are all the beer names. Opening just this past year in 2013 this brewery is located in downtown Edmunston in an old police station that has been renovated. The primary contacts André Léger, Mychèle Poitras and André Morneault but they are supported by the community, friends, and family including over 80 shareholders! They have a variety of different beers in different styles but they follow the traditional Belgian style of brewing combined with local flare and experimentation. 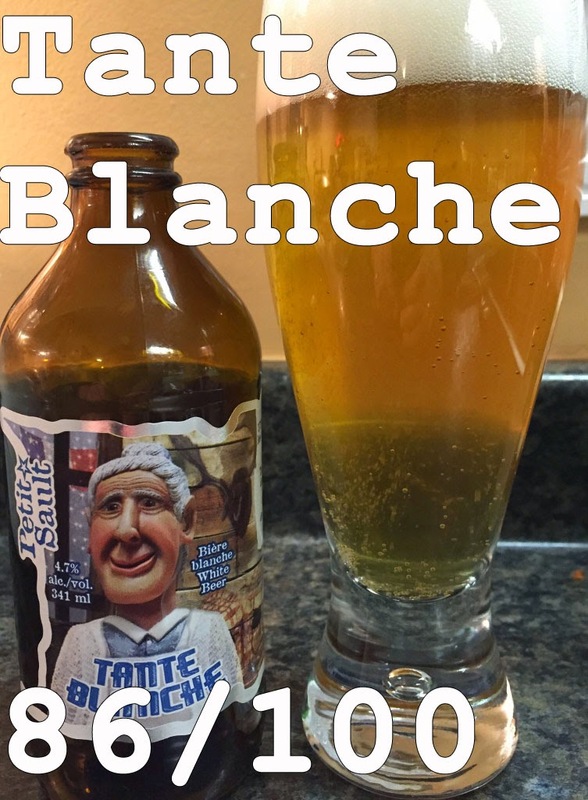 The particular beer we are trying is a Belgian White (wheat) beer called “Tante Blanche.” or “White Aunt”. Brewed with the traditional ingredients of Barley, Wheat, Hops, and a hint of orange, this one promises to be quite good. Appearance: Golden brown, slightly cloudy, good head that retains well. Smell: Orange and Apricot notes on the nose followed by the slight citrus notes of the hops. Taste: Orange and apricot come through balanced with the malt and the hops to create a really smooth drinkable beer. The tastes work very well together and while drinking it I could find no complaint compared to the Jeune Geule we had the other day or the big names. It is a strong Belgian white that I’m excited to find here in the Maritimes. Mouth feel: Creamy mouthfeel from the wheat malt combined with mild carbonation for a smooth finish. Overall: Strong, well balanced Belgian white beer that blends well and has a nice flavour profile. For a Belgian white I can find no complaints and feel that this is a very strong beer. Compared to the Hop Blanc and the Jeune Geule that we have seen on this blog already, this one is right up there with them in respect to quality and style. Do I like it: I really do. I am finding that I really enjoy the Belgian whites as I try them more and more. The combination of flavours with the creamy smooth texture makes for an overall appealing beer that drinks well and tastes great. I still like the Hop Blanc better because it combines this style with the hoppiness of an IPA which I also love. This one displaces Jeune Geule for my second favorite beer of all the ones I’ve blogged about.